Roland visited his brother, Ben, in California. Roland was making this an “American” trip, in which he included several locations. His first was with Ben and his family. Ben lived just west of Sacramento, and planned a camping trip with his brother to see some sights. He also took the little Sunfish sailboat along, on a trailer behind the car. 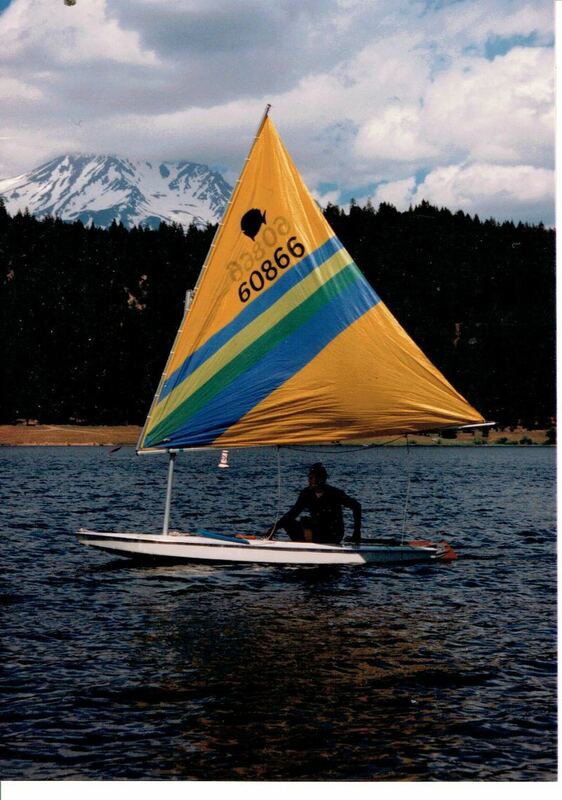 Ben had trained his kids how to sail on Folsom Lake north-east of Sacramento, in the ’80’s, when the lake still was full. He taught them what to do if the boat tipped. Trying to tip the boat on purpose turned out not to be that easy. But they succeeded, and gradually lost track of the mast as it slowly turned up-side down submerging in the water, and the hull sticking up. They had to turn the boat, so that the front would be facing the wind, because once they managed to get the mast up again, the wind would be caught in the sail and they did not want to try to tilt up the boat against the wind. One place Roland and Ben ended up was at Lake Tahoe. This is a very deep lake up in the Sierra Nevada with half of the lake in California and half in the state of Nevada. It is a very well known lake, especially in the winter when it becomes a ski heaven. The winter Olympics have been held there. They launched the boat, but became aware very soon that even at the end of May, the water is still extremely cold. In the sailboat, it was nice, basking in the sun, but you did not want to tip over and end up in the cold water! Neither of them were afraid of tipping over, but the cold water did not attract them to even think about it. Here they were, Roland and his brother Ben sailing on Lake Tahoe, in a nice breeze with the mountains surrounding them. It was a great day. That afternoon they found a campsite, did their cooking, and had a nice evening by a campfire. They traveled Highway 395 along the Sierra Nevada ridge and found multiple, nice campgrounds. From California, Roland went to New Orleans. He was especially interested in seeing the results of hurricane Katrina. With his education in dike and dam construction, he wanted to compare the damage done there, in comparison to the 1953 flood in Holland. Not only the physical damage done, but the influence of politics and culture caught his attention. He realized his prejudice as to how the Dutch took care of floods, versus Americans. After all, he knew the background of how the Dutch try to control water, but really not so much about the background in America. He realized that his description about the 1953 flood would appear far more descriptive and fascinating that his description about Katrina, by comparison. Roland figured he should ask Ben about American culture, since Ben emigrated to California about 25 years ago. What was the culture like in New Orleans? What background should Roland include? In Holland, he knew that protection was so critical, because ⅓ of the country would be under water. Even Ben had trouble helping! He lived in California. He had read about Katrina, but it was somewhat removed from California, to really understand it. After all, California had its flooding, but that was nothing compared to New Orleans. California dealt more with drought. Even seeing the news about Katrina, or flooding in the Mid-West, did not quite resonate. People in the Mid-West are scared stiff thinking about all the earthquakes in California…! Ben was more afraid of hurricanes he would have to face if he lived in the Mid-West. It is a challenge to write a story about flooding and drought in different countries, even in different states within a country, and be balanced on both sides of your story. You have to know who you are, to identify your prejudices. Are you prejudiced about the functions and uses of water?